Then Jesus said, "What is God's kingdom like? What can I compare it with? 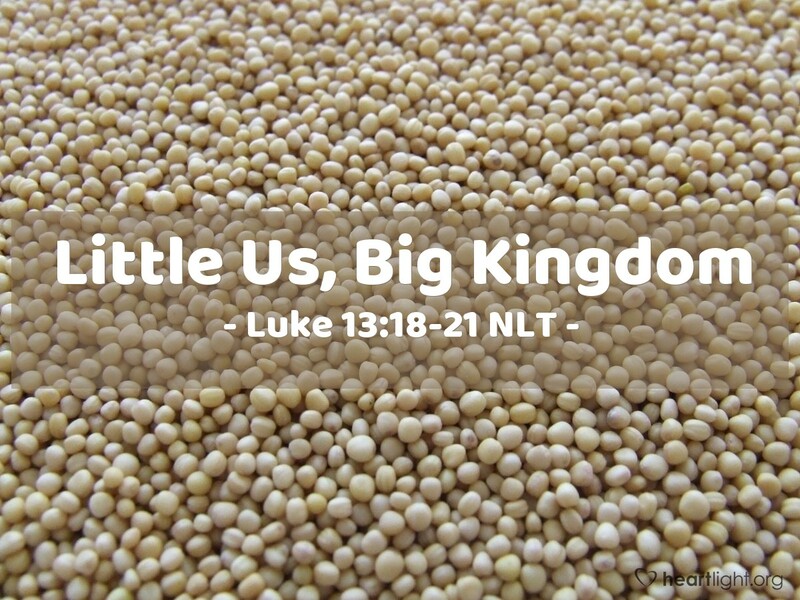 God's kingdom is like the seed of the mustard plant. A person plants this seed in his garden. The seed grows and becomes a tree. The birds build nests on its branches." Jesus said again, "What can I compare God's kingdom with? It is like yeast that a woman mixes into a big bowl of flour to make bread. The yeast makes all the dough (bread) rise." The Kingdom isn't about logic or predictability, but about God and his sovereign power and grace! God can take something small, someone insignificant, even a person who is broken, and do phenomenal things. A huge tree comes from a small seed. A whole loaf is leavened by just a touch of yeast. God asks us to offer him ourselves—not someone we would like to be or might someday be, but ourselves as we are now. If we will give ourselves, our all, we can be caught up into God's powerful and mysterious work of the Kingdom. Father, Lord God Almighty, I offer you all that I am to serve you and bring glory to you. I long to be a part of your triumphant work of the Kingdom. In Jesus' name. Amen.